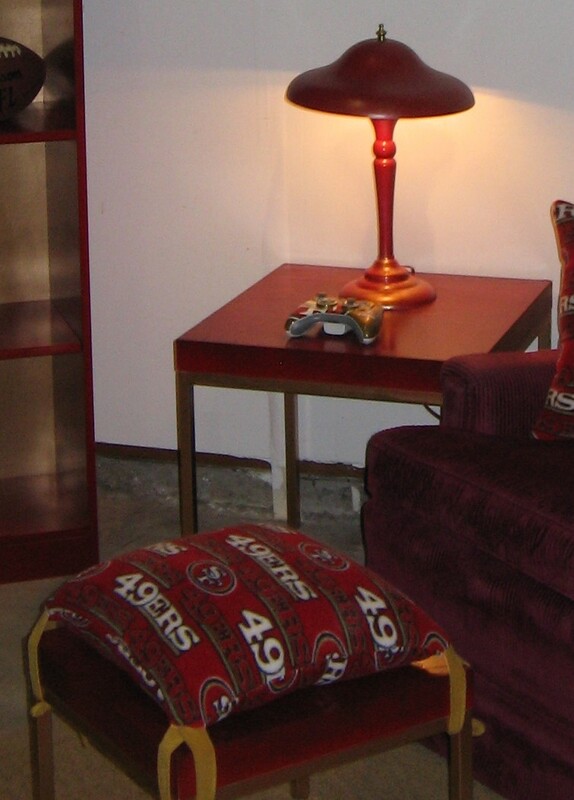 In my last post, I showed you the Man Cave makeover that I did for my 49ers fanboy hubby. Today, I just wanted to share a bit more specific detail on how a little spray paint helped turn trash into treasure! We had a garage sale recently, and after I decided to do the Man Cave, I went rummaging through the garage sale leftovers. You know that if it didn’t sell at a garage sale, it’s really at the bottom of the barrel. Then again…. Here is a silver and gold touch lamp, and two end tables that are part of a three-table set. Each table is smaller than the next, so they can nest underneath each other. I decided that the smallest and largest table would work best for my purposes. Just add a little San Francisco 49ers colored Krylon spray paint, and voila! I covered the entire lamp and the tops of the tables in Cherry Red. 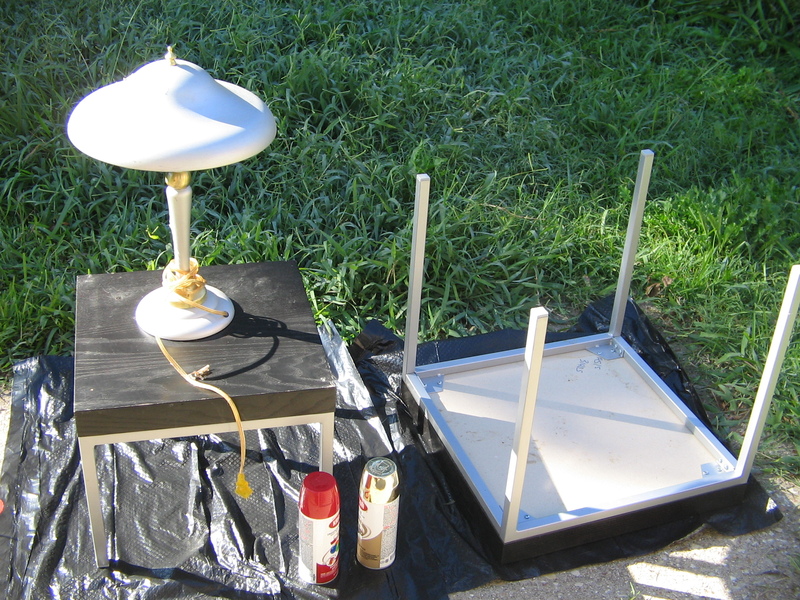 Then, I sprayed some gold metallic paint lightly over the red lamp to give it a speckled appearance. I used the rest of the gold to paint the metal frame and legs of both of the tables. As you can tell, the smaller table was turned into a footstool. I’ll be covering a How-To on the footstool cushion in my next post. There are quite a few drips on the sides, and an uneven texture to the back panel. Most of these drips are on the back. The gold hardware came out nicely, though! But, all in all I think it all turned out okay! I’ve said it before, and I’ll say it again. It’s amazing what a few cans of spray paint can do. 4 Responses to "A Little Spray Paint Goes A Long Way"
Some genuinely great info , Sword lily I found this. “Treat your friends as you do your pictures, and place them in their best light.” by Jennie Jerome Churchill.